Picture this. I am walking and I drop my phone. No damage to the blackberry. Whew! But as I bend down to get it I feel my skinnys rip from the bottom to the top. Total cheek showcase. The only thing that saved me from the worst wardrobe malfunction this side of the Mississippi was the tunic I was wearing. It covered me until I could cover my boo-tay. Now. I am not going to put the skinnies brand on blast because I wore these jeans WAY over their due date however I am going to show you the pic because it's just too funny not to: RIPPED SKINNIES. Check out these tall tunics. Want a tall shirt that you don't see here? TallSWAG Shirts and Tops page to the rescue! LEL BLOUSON TUNIC at Tallwomensclothes.com. $48. Sizes S-XXL. 33.5 inches from shoulder. TESTAMENT CYMBIDIUM TUNIC IN GRAY. $79. Size S-M left. COVET ONE SLEEVE at Longlegs.ca (7th down on the page). $64.50. Sizes S-XL. Shown in white. Also comes in black. COWL NECK ELASTIC WAIST TUNIC DRESS at Longtallsally.com. $65. Hurry going fast! TALL TYE DYED PEASANT TUNIC at Womanwithin.com. $21.99. Sizes M-6X. 32" long. Shown in deep jade. Also comes in rose pink, royal blue and pumpkin. TALLS TROPIC TUNIC at Softsurroundings.com. $68.95. 37" long. Sizes 2-4. RUFFLE TIME. Featured styles from left to right: Cambray Tie Neck Blouse (Gap.com, $59.95), Mini Herringbone Skirt (Longtallsally.com, $65) and Tall Short-Sleeve Ruffle Wrap Dress (Bananarepublic.com, $98). CHAMBRAY TIE NECK BLOUSE at Gap.com. $59.95. Sizes tall S-XL. MINI HERRINGBONE SKIRT at Longtallsally.com. $65. Sizes 8 to 18. 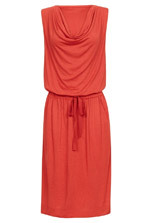 TALL SHORT-SLEEVE RUFFLE WRAP DRESS at Bananarepublic.com. $125. Sizes M and XL. Online exclusive color. I seriously want cold weather just so I can wear this comfy Tall Textured Belted Cardigan. It's soft, it's long in the body and arms and is so going to be one of my staples for those kick back winter days. I know you are picturing yourself in it right now so just go ahead and click the pic and order it. TALL TEXTURED BELTED CARDIGAN at Bananarepublic.com. $130. Sizes XS to XL. Navy! Navy! Navy! This is a color that you need for fall10. It looks great on all skin types and is everywhere right now. I love this sheer top because it's soft, beautiful, has classic lines, can go from day to night annnnnnd it's navy! Don't love my pick? Trust me. I won't be offended. Click your way to your own navy selection with the links to the left. TALL 382 LONG SLEEVE BLOUSE IN NAVY at Tallcouture.com. $89. Sizes small to extra large.